If you are a thrifty consumer, you probably already know that using price comparison sites are a great way to save money on gadgets. But I am tired of shopping around for shopping sites. When it comes right down to it, I want to visit one site with a simple selection of core features that are focused on one thing and one thing only—helping me save money. Vendors: Naturally, every good comparison engine needs to establish relationships with as many reputable vendors as possible. Giants like PriceGrabber, Shopzilla, Shopping.com, and Yahoo Shopping generally meet this requirement. Coupons: Sites like RetailMeNot and MyCoupons.com are great, but that data should not be singled out in a standalone site. It should be integrated into standard search results (like Yahoo Shopping). Price Alerts: Obviously, if I am truly searching for the best deal, I want to be informed when it happens. The tool to set up price alerts should be prominently displayed. PriceSpider does a good job of this. Sites like Become.com even offer price drops via email without registration. On the other hand, sites like Shopzilla don't even appear to have the feature—or they hide it behind a registration form. Of course, there are numerous sites out there like ZooAlerts, PricePinx and Camel Camel Camel that specialize in price alerts, but I don't see much value in those—especially when they are focused entirely on one shopping site like Amazon. In this economy, any site that can help a consumer find a great deal is going to get some attention, and I think price tracking is a smart concept, but it's nothing new. While the sites you mentioned: Gazaro, Zoolert, and PriceSpider have jazzed things up a bit with a web 2.0 look, price tracking has been available on shopping comparison engines (aka price comparison engines) like NexTag and PriceGrabber for a long time. I think that price alerts are a simple feature. I don't think there is enough meat there to make a real product or business. If you look at Gazaro and Zoolert versus PriceSpider, you'll see that PriceSpider is generating much more traffic. I think this is partly because PriceSpider has ventured beyond just price alerts to shopping comparison engine listings. Just because a price tracking site shows you a seemingly great new alert, the buyer should always beware. Most price tracking sites that I've looked at do not have a deep depth of merchants, but are rather just joining some select affiliate programs through Commission Junction or Linkshare. Because of this, a price drop from one merchant might look impressive, but in the end might not actually provide a consumer with a great deal. A Clean, Usable UI: With so many details to keep track of, it's not easy to keep things clean. Personally, I have never been a fan of NexTag's layout—it seems kind of text heavy and convoluted to me. On the other hand Shopzilla has taken a more Web 2.0 approach while Google Product Search stays true to the Google design mantra. In the end, this is really a matter of preference. User and Expert Reviews: Another no-brainer. Again, these should be prominently displayed with the product. 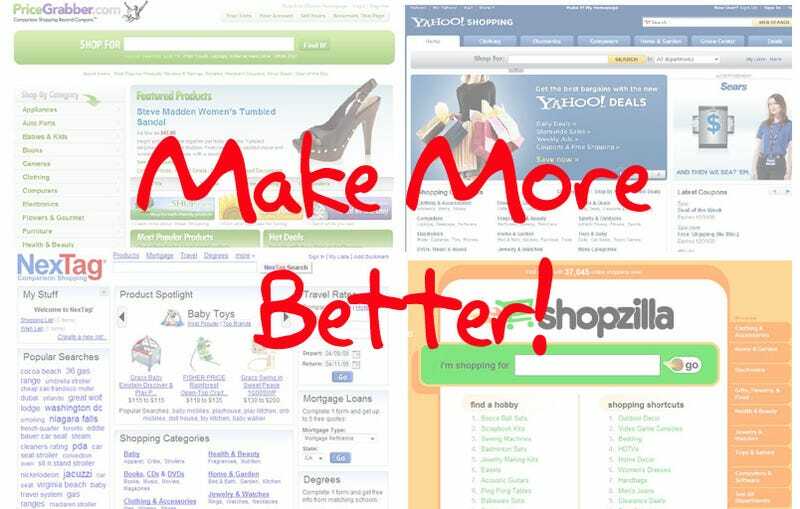 Consumers should make sure to take a look at a shopping behemoth like Shopzilla or Yahoo! Shopping before making a purchase. Yahoo! Shopping has an extremely comprehensive deal section, and even better, the site integrates coupons right into shopping comparison engine listings so consumers will have greater transparency into the deal (see the listings for Crutchfield, Tiger Direct, and ABT). So using a site like Yahoo! Shopping provides the consumer with a greater number of merchants, a shopping comparison engine experience (sort by price, rating, etc. ), and integrates coupons. Until one site puts all of the pieces together, it will still be necessary to check multiple websites to ensure that you are getting the best deal online. Hopefully, my rant on comparison engines will, at the very least, help you narrow down the search to save both time and money.